I had the pleasure of meeting Roshani at ALA Annual this year in Orlando, and she was just the cutest and sweetest! This made me even more excited to read her books. 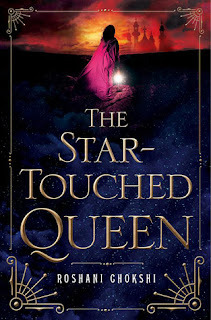 I had heard a lot of good things about The Star-Touched Queen, so I was very glad to discover that it lived up the hype. The second thing that I loved about The Star-Touched Queen is the world-building. This book is rich in it. The descriptions are lush and fill all your senses. It was the imagery and the world that transported me in this story. The plot was good, the romance was good, the supporting characters were intriguing (Kamala was hilarious! ), but admittedly those did not keep me turning the pages of this book. What drew me into this one was reading about the Night Bazaar and the many rooms in Akaran. On a final note, I listened to this book on audio, and the reader did a great job! As soon as I finished this story, I immediately started listening to A Crown of Wishes, and I am so happy to be transported back into this fascinating world. I tried reading this one and couldn't get into it. I'll have to check out the audio! Awesome review!